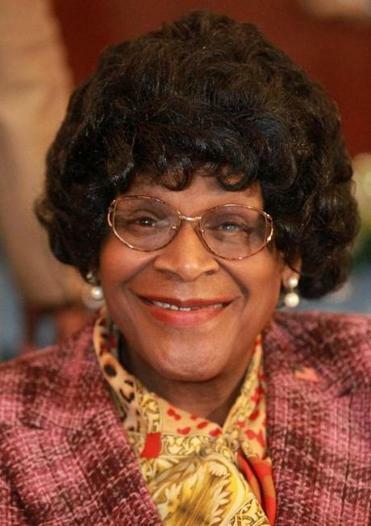 Althea Garrison won a 1992 state House bid. It took years. Decades, in fact. But political gadfly and perennial election candidate Althea Garrison was all smiles as she set up shop in an Adirondack chair on City Hall Plaza Wednesday morning: She is going to be on the Boston City Council. “It’s what I always wanted — that’s why I ran,” said Garrison, 77, in between introductions with some of her future colleagues, including District 2 Councilor Ed Flynn, who was passing by on his way into City Hall and stopped to say hello and welcome, and Council President Andrea Campbell, who approached for a handshake and to extend congratulations. Garrison, in a navy blue dress with an American flag pin attached, and a pair of sandals over nylons, was beaming. After decades of trying, in various elections, she finally got in. Credit Councilor Ayanna Pressley, whose win in the Democratic primary for the 7th Congressional District Tuesday will result in her vacating her at-large seat – one of four on the 13-member council. That will probably happen in January when she is sworn into her new position, though an advisor could not say Wednesday whether she would consider stepping down sooner. By city rules, the next-place finisher for the at-large seats in the last municipal election will be offered the post. That would be Garrison, who finished a distant fifth in the November election with 6.87 percent of the vote, behind Pressley (who had 21.64 percent), Michelle Wu (24.47 percent), Michael L. Flaherty (19.44 percent), and Anissa Essaibi-George (17.14 percent). If Garrison turns down the opportunity, the post would be offered to the next-place finisher – in this case Domingos DaRosa, who had 4.38 percent – until all candidates for the at-large seats had been considered, according to City Clerk Maureen Feeney. Boston city councilors are paid about $100,000 a year. The rules for an at-large council seat differ from a district seat. If an incumbent district councilor steps down, the city would hold a special election to fill the post. Two years ago, Councilor Frank Baker proposed a new law that would have required a special election any time an at-large incumbent resigns with eight months or more remaining in the two-year term, said Feeney. The proposal was never adopted. Baker said his proposed measure was never meant to target a specific candidate; on Wednesday, he stopped to congratulate Garrison on her anticipated ascension. But he said voters should have a say in deciding who takes an at-large seat on the council, just as they do in district races, because voters’ interest in a candidate can change. Just look at Tuesday’s wave of newcomers into office in Massachusetts over established incumbents, he said. Feeney, speaking generally, said she will initiate the process of reaching out to the next-place finisher in the councilor at-large contest once she is officially notified by the city election commission of a vacancy and the candidates’ placement in the last election. But that process will not begin until after Pressley steps down. Garrison, who lives in Dorchester, said she was looking forward to the opportunity to serve on the council. She said she will focus on such issues as affordable housing and services for seniors and veterans. Those are core values she said she has held since she won an unusual election in 1992 for state representative and served one term. At the time, Garrison ran as a Republican against the incumbent Democrat, Nelson Merced. Merced failed to turn in the proper nomination papers and never made the ballot, opening up an easy victory for Garrison. She served two years. Garrison has worked in various low-level state jobs since then, though she appears to have retired. On Wednesday, she would only say that she continues to work in the community, as an advocate. She said that’s why she has repeatedly run for public office – as a city councilor, state representative, and mayor. She has run as a Democrat and as a Republican, but never came close to winning office again. First, though, she still has another race to run: She is on the ballot as an independent candidate for state representative in the 5th Suffolk district, the seat she won 26 years ago.